Students and scholars reading the secondary literature on Galatians must often negotiate specialized language and complex lines of argument. 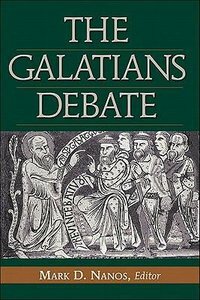 In addition to the theological jargon that traditionally characterizes discussion of Galatians, one now encounters a significant amount of rhetorical and sociohistorical terminology, and the reader's familiarity with this specialized language is increasingly assumed. This volume is designed to facilitate familiarity with the contemporary issues central to the interpretation of Galatians and to present examples of the prevailing points of view as well as some recent challenges to them. The essays included explore the rhetorical and epistolary approaches to examining Galatians, comprise a comprehensive introduction to significant research in the field, and represent some of the best work available. Mark Nanos offers an introduction and glossary of terms to help students begin their study and a comprehensive volume bibliography and modern author and ancient sources indexes for those who are continuing on to further study. About "The Galatians Debate: Contemporary Issues in Rhetorical and Historical Interpretation"
Mark D. Nanos is Soebbing Distinguished Scholar-in-Residence, Rockhurst University.